Triclosan’s leading role is in approximately 75% of liquid hand soaps in the United States, but he also regularly appears in dish soaps, toothpaste, cosmetics, antiperspirants, cutting boards, toys, fabrics and other everyday products. Despite his reputation as a “squeaky clean” actor, Triclosan has been negatively impacting the health of humans and our aquatic ecosystem. 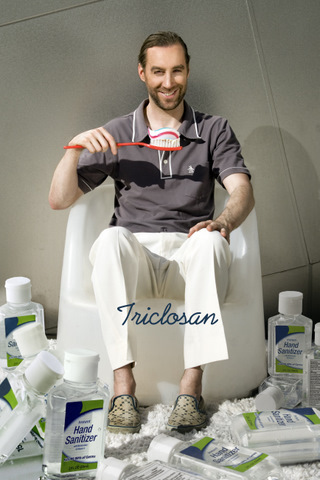 Triclosan knows just how to get under his audience’s skin! He is found in most American bodies and in 75% of urine samples in a study from the Centers for Disease Control and Prevention. The European Commission’s Scientific Committee on Consumer Safety determined that even small amounts of Triclosan can set off antibiotic resistance in bacteria, and Canada has banned Triclosan from consumer products. In 2009, Beyond Pesticides and Food & Water Watch, along with 86 other nonprofit groups filed a petition with the U.S. EPA asking the agency to consider banning Triclosan in consumer products. In 2011 the Campaign for Safe Cosmetics and other environmental health organizations have asked the EPA and the FDA to ban Triclosan from household products, and asked consumers to take the Triclosan-Free Pledge. Actor: Kevin Carter. Photo by: Patricia Mateos Ballestero. Check out the Campaign for Safe Cosmetics and Cancer Schmancer.